Banff and Buchan MSP Stewart Stevenson has signed a Parliamentary Motion, lodged by his SNP colleague, Brian Adam, noting the important role which science plays in our lives. “The aims of National Science Week are to celebrate science and its significance to our lives. I think it is great that people of Scotland will be given the opportunity to partake in science activities and experiments and to involve themselves in science discussions. 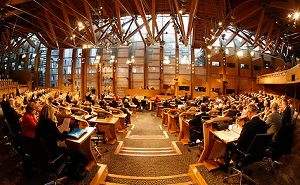 Banff & Buchan MSP Stewart Stevenson has tackled the Scottish Executive over its draft healthcare budget. One of its objectives for the coming financial year is that access will be available to “a GP, nurse or other healthcare professional within 48 hours”. However, an exception has been made for dental services. Mr Stevenson – who has been campaigning for additional resources to improve dental service provision in the North-east – questioned Deputy Health Minister Tom McCabe on this at Question Time. “The situation regarding dental provision in the North-east remains deeply concerning to the many people who have found themselves, through no fault of their own, unable to access dental treatment in their own area. “I was disappointed that the Minister chose to hide behind the current consultation on modernising NHS dental services, which ends this week, instead of giving a commitment to urgently address the current problems in the North-east. Banff and Buchan MSP Stewart Stevenson has has given his backing to Prostate Cancer Awareness Week and has signed up to a motion in the Scottish Parliament to heighten awareness. “It is very concerning indeed to learn that prostate cancer is now the most common cancer in men causing around 10,000 deaths annually in the UK. Recent figures from the Office of National Statistics telling us that 1 in 11 men will be diagnosed with prostate cancer in their lifetime. “With such startling statistics, it is therefore vital that we generate greater awareness and understanding of the basics of prostate cancer. I hope that the awareness week will help to encourage men to get informed about prostate cancer and let as many people as possible know about the information services that are available. “Recognition must go to the charities and support groups who are involved in this condition who provide an invaluable service. Hopefully, the awareness week will be successful in increasing public awareness overall and break down the stigma and embarrassment often associated with the disease. Following his approach to the Asda Supermarket chain with concerns that the Saltire and words ‘Scotch Beef’ had been dropped from their meat labels in some of their outlets, Banff & Buchan MSP Stewart Stevenson today welcomed the response of Tony DeNunzio, President and CEO of Asda in the UK. “As the elected representative of one of the foremost beef-producing areas in Britain, I can assure you than this development caused a considerable amount of dissent from both consumers and producers in this area”. Mr DeNunzio admitted to the MSP that there had been some ‘lack of clarity’ with Asda labelling, which had now been rectified. “Asda has assured me that the majority of beef sold in their stores is Scottish – and will continue to be packaged with the distinctive Scottish Saltire label. “Like Scotch Whisky, Scottish Beef is firmly established as a market leader of quality throughout the world, and it almost beggars belief that a company such as Asda should consider the retrograde step of removing the distinctive Scottish brand label from its produce. Any attempt to dilute the strong market identity of this product is one that is likely to meet with strong customer resistance. Certainly it is one which is contrary to the received intelligence of most marketing organisations. By selling Scottish beef, Asda is already providing its customers with the premier product – it would defy logic not to advertise that fact”. Stewart Stevenson MSP today welcomed the response he has received from Justice Minister Cathy Jamieson that the working group on police funding are to make further adjustments to the Grampian Force allocation. The SNP MSP for Banff and Buchan has been pressing the Justice Minister for an increase in Grampian Police Force funding. “Figures recently released by the Justice Department reveal that Grampian Police force has the lowest ratio of police officers per head of population in the whole of Scotland, which is a deplorable situation. I have been on a Saturday night patrol with Grampian Police, and have first-hand experience of the dangers of undermanning on the front line. He called on Justice Minister Cathy Jamieson to commit adequate resources to ensure that Grampian Police can have sufficient officers on the ground. Currently there are only 25 officers per thousand head of population in the Grampian force area, compared with 34 officers per thousand in Strathclyde. Mr. Stevenson drew attention for the fact that there had been a steady decline in Special Constables in the Grampian force since 1995, and welcomed the volunteer recruitment initiative currently under way, headed by Assistant Chief Constable Patrick Shearer. There will be a Media Opportunity on Monday 22 March at 2.30pm at the Waterside Inn, Fraserburgh Road, Peterhead. Banff & Buchan MSP Stewart Stevenson will join officials from the Heritage Lottery Fund in congratulating members of the Buchan Heritage Society on their successful lottery application. Mr Stevenson, who supported the society’s application to the Heritage Lottery Fund, will present Mr Sandy Ritchie of the Buchan Heritage Society with a certificate of award from the lottery. The handover will mark the start of the Lottery Roadshow which has been arranged by Stewart Stevenson to try to generate more applications and bring more lottery money to the North-east. The event will bring six different lottery funding bodies together under one roof offering local organisations a ‘one-stop shop’ of advice. Officials from the Community Fund, the Heritage Lottery Fund, SportScotland, the Scottish Arts Council, the Scottish Land Fund and Fresh Futures will be on hand with displays and information. The roadshow is being sponsored by the Clydesdale Bank and bank officials will also be on hand to offer advice to local groups and organisations on the services they can offer. “I was shocked to learn that the lack of deaf awareness could cost the NHS the staggering amount of £20 miilion in one single year. Obviously, this is a very worrying figure indeed and a trend which seriously needs to be reversed. “Money is lost due to deaf and hard of hearing people missing their appointments, simply via poor communication. Even more worrying is the fact that many deaf and hard of hearing people leave hospitals unclear of their condition due to communication problems with their GP or Nurse. Furthermore, it is very serious indeed that over one third of British Sign Language users were either unsure of the correct dosage of medication to take as their health professional could not communicate effectively. “EXECUTIVE'S CHANGE OF HEART WELCOME STEP FORWARD"
During his questioning of the First Minister today (Thursday) SNP MSP for Banff and Buchan Stewart Stevenson welcomed the commitment he has received from Acting Fisheries Minister, Allan Wilson, that he will meet EU Commissioner Franz Fischler next week. "The SNP have been campaigning for a direct engagement with the EU on the subject of fishing for some considerable time. At last we see a recognition that we can only make progress when we put our own case face to face. "Until now, the Scottish government have always maintained that Westminster can represent our interests. "Today's change of heart is a welcome step forward. The Minister must now put Scotland's case with vigour." On the subject of the closure of haddock fisheries due to lack of usable quota, the First Minister was less encouraging. "Any change in the regulations, or amendment of the size and position of the restricted fishing area, is uncertain. "It was therefore very disappointing that Jack McConnell had nothing to offer fishermen in the interim other than to continue discards of marketable fish. "This flies in the face of conservation, the very objective which the Common Fisheries Policy claims to advance." Banff & Buchan MSP Stewart Stevenson has reacted angrily to a letter from Scottish Ambulance Service chiefs that it will now be October 2004 before they are in a position to make a decision on the upgrading of Peterhead Ambulance Station to 24-hour status. Mr Stevenson and local MP Alex Salmond helped secure 24-hour status for Fraserburgh Ambulance Station and were advised by ambulance chiefs that Peterhead – as the busiest part-time station in the country, then second only to Fraserburgh – would be upgraded the following year. At a meeting in Edinburgh, the Chief Executive of the Scottish Ambulance Service then advised that he would be in a position to make a decision on when the upgrade would take place by March 2004. “I am extremely angry that a promise originally made by the Scottish Ambulance Service for March 2004 now appears to be moving to late 2004, which does not even have the certainty of the previous commitment. “This is particularly unacceptable when out-of-hours cover for GP services is about to undergo a period of change. It is likely that the ambulance service and paramedics will have to play a much bigger role in providing cover overnight and at weekends. “This strongly reinforces the need for 24-hour cover at Peterhead Ambulance Station and I would have expected this to have injected some urgency into the situation, rather than it being placed on the back-burner. Local SNP MSP Stewart Stevenson has arranged a Lottery Funding Roadshow to try and redress the current low level of Lottery Funding in the North-east. The Roadshow will run from 2.30pm to 8.00pm at the Waterside Inn, Fraserburgh Road, Peterhead on Monday 22nd March 2004, and will be attended by staff from six different Lottery Funding agencies. Stewart Stevenson has invited a number of people who have previously indicated an interest in attending, and he is actively promoting the event to other organisations that may benefit from Lottery Funding. Salmond & Stevenson Say "Axe the Council Tax"
Banff & Buchan SNP Parliamentarians Alex Salmond MP and Stewart Stevenson MSP have thrown their support behind SNP plans for reform of the Council Tax system. Half a million pensioners will be taken out of local taxation under plans announced by Shadow First Minister John Swinney MSP, while hundreds of thousands more Scots will see their bills fall. A typical single pensioner on a low income would pay nothing. A pensioner couple with an income of £11,500 would save an average of £933 per year on a band D home. A single parent with an income of £13,400 would save an average £322 per year on a band B home. A family with a joint income of £38,400 would be largely unaffected, saving on average £13 per year on a band D home. A more affluent family with a joint income of £52,000 would see a modest average increase of just £74 per year on a band F home. High earners with a joint income of £136,000 would see their bills increase by, on average, more than £3000 per year for a band H home. “Pensioners are being penalised under the Council Tax for working hard and saving hard all their lives. Bills of two thousand pounds and more being meted out to people on incomes well below the average wage is simply unjust. “These proposals offer help, not just to pensioners but also to hundreds of thousands people in Scotland on modest and low incomes. They will see their bills cut dramatically and the principle of ability to pay introduced into local taxation. "Local Income Tax works because everyone who can pay makes a contribution. It spreads the burden of taxation across all those who can afford it and lifts the burden from the shoulders of those who can't. Banff and Buchan MSP Stewart Stevenson has raised the concerns of local allergy sufferers, in particular those with nut allergies, after receiving representations from constituents. "Most people suffer from allergies to a greater or lesser extent; indeed the Royal College of Physicians reported that 18 million people in the UK have allergies. For most people, this causes only mild inconvenience and is easily managed. For others, allergies can be life threatening and allergies today are becoming severe and more complex. "I have received representations from constituents, a number of whom are members of the Anaphylaxis Campaign, who help people with severe allergies live their lives. "My constituents have highlighted to me the constant vigilance which is required to check every grocery item’s ingredient list, sufferers must carry an Epipen adrenaline injection at all times and children who suffer from nut allergies cannot accept sweets or drinks from their friends. This obviously has an effect on every day life. “My constituents are concerned that not enough assistance is available from the Health Service and government. I have therefore written to the Health Minister as well as the local health authorities to press these concerns. I have also raised with local authorities to ask what provision they have to ensure that items such as nut free products are available in school meals. “I hope that this added pressure will raise awareness of allergies and will lead to action to remedy the situation." Banff and Buchan MSP Stewart Stevenson is backing Parliamentary calls to ensure increased safety standards on school transport. The MSP has recently given his backing to parents concerned that school buses in their area are operating – quite legally – with no safety belts. “I think it is something of a loophole that minibuses and coaches used for school transport must have safety belts fitted yet buses which fall between these two definitions can quite legally be used on school runs. "Every effort must be made to secure contracts only with companies whose buses are fitted out with seatbelts and meet required safety standards. "The Scottish Executive step up their efforts to make school transport safety a top priority. Parents need a degree of security in knowing that their children will be safe travelling to and from school. In addition, the importance of wearing a seatbelt is a message that should be reinforced in schools." Banff and Buchan MSP Stewart Stevenson has welcomed a survey carried out by Lloyds TSB which forecasts that farm incomes are to rise in the coming financial year. "Farming has suffered some tough challenges in recent years, in particular, low farm incomes. I am therefore encouraged with the results of the Lloyds TSB survey which shows the average Scottish farm income for 2003/04 is forecast to be £17,000, which is a much better figure than in recent years. “However, I am aware from my discussions with farmers and NFU Scotland members that these forecasts must be treated with some caution as last year’s forecasts were on the optimistic side. "Generally speaking, the rise in commodity prices last year enabled the average cereal farm to return to profitability, which is good news. "The survey indicates that the recent industry difficulties may have passed allowing a more optimistic view to prevail. Higher farm incomes, coupled with the approaching reform of the Common Agricultural Policy will ensure a more viable future for many farm businesses which are so vital to Banff & Buchan’s economy.